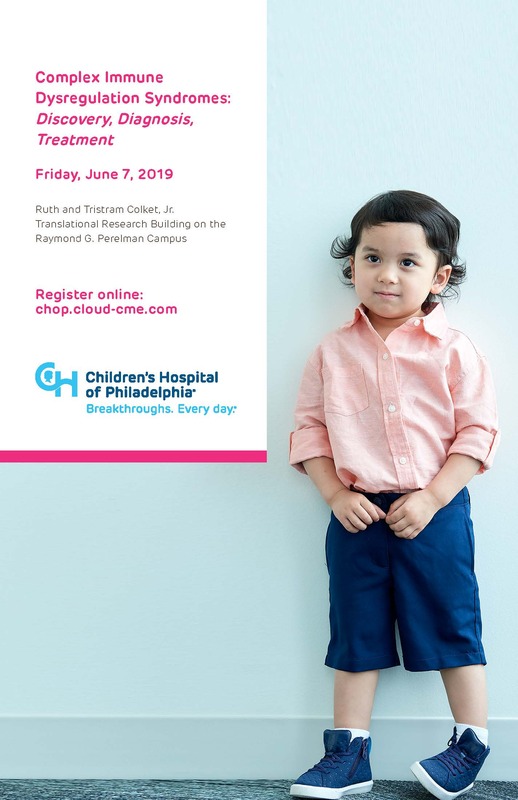 This one-day course will provide an overview of the most common functional GI and motility disorders in pediatric populations. 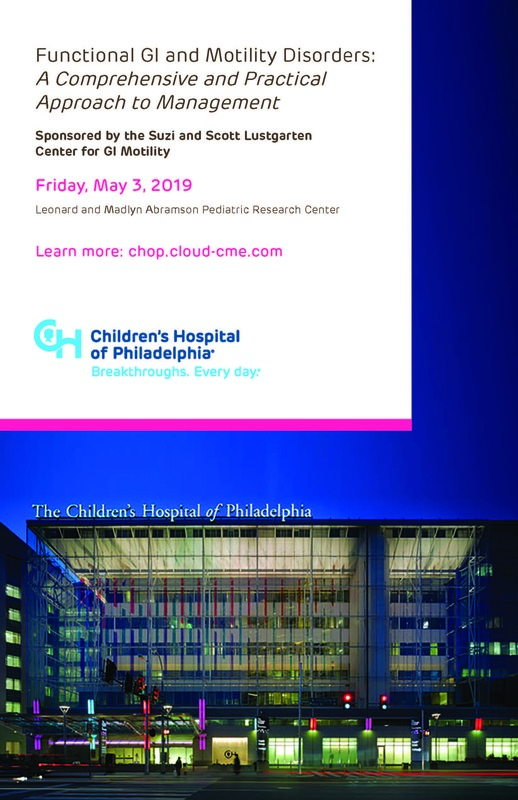 Children’s Hospital of Philadelphia’s Emergency Department presents the 7th Annual “Best Practices in Pediatric Emergency Nursing”. Conference format includes lecture, simulation, skills stations, and interactive quick sessions. 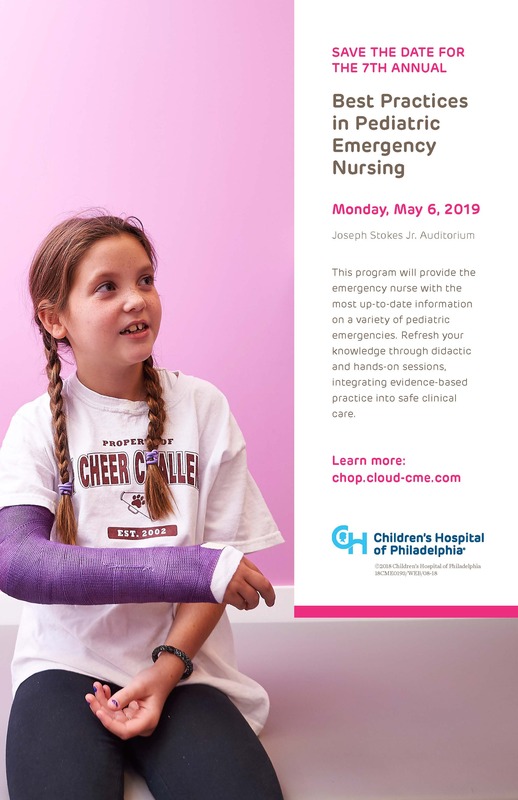 Content is applicable to all levels of nursing expertise, pre-hospital care providers and students interested in expanding their knowledge in caring for the pediatric patient with an emergent condition. 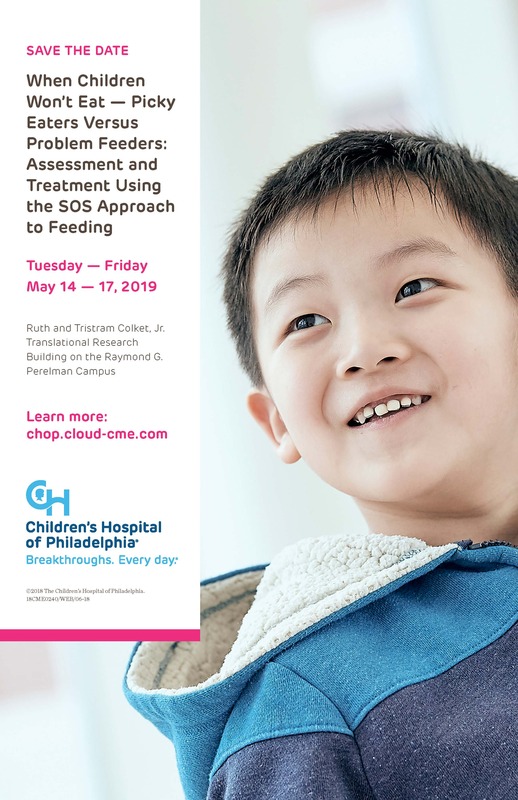 Leading faculty utilize evidenced based guidelines and expert pediatric opinion to engage participants on hot topics within pediatric emergency nursing. Refresh your practice with these updates and make a difference at the bedside, one family at a time. tTe 6th International Conference on Clinical and Engineering Frontiers in Pediatric and Congenital Heart Disease will bring together leading professionals in both the engineering and medical disciplines to foster collaboration between these two communities in the study of treatment of congenital heart diseases. Please note: the days are different from past conferences. This course is SOLD out, we are no longer taking registrations. 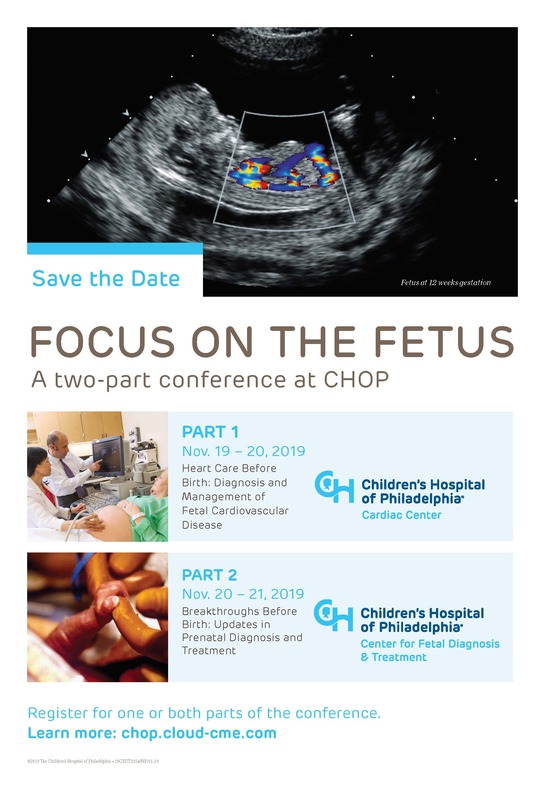 This course is intended as an alternative to adult emergency and critical care ultrasound courses, with a focus on pediatric emergency and general pediatrics ultrasound indications. It is designed for pediatric emergency medicine, general pediatrics neonatal and critical care medicine providers with limited or basic knowledge of emergency bedside ultrasound. Through a combination of lectures and hands-on practical sessions using live pediatric models and simulation equipment, course attendees will learn ultrasound fundamentals (physics and principles of scanning) and ultrasound scanning techniques pertinent to pediatric practice, including: basic procedural guidance (line placement, lumbar puncture, etc. ); evaluation of abscesses and foreign bodies; bladder scanning; FAST (focused assessment with sonography for trauma); lung evaluation; basic cardiac evaluation; musculoskeletal applications (fracture and joint); bowel scanning (intussusception); fluid and function evaluation; and advanced procedures (nerve blocks, chest tube placement, peritoneal/pleural fluid drainage). The course is being taught by emergency, neonatal and critical care ultrasound experts, and will have a low student-to-teacher ratio of 4/5 to 1. A limited portion of the course will be devoted to a knowledge and skills assessment exam and a brief discussion of program development and administrative issues with regard to point-of-care ultrasound. 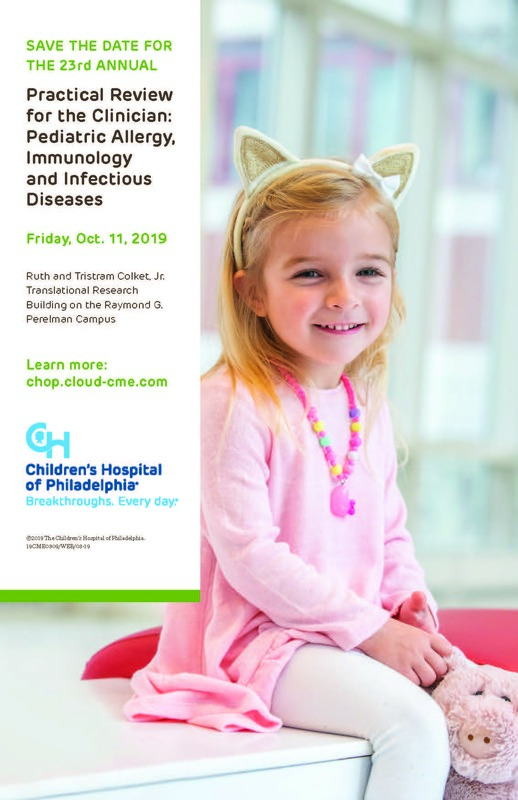 A symposium hosted by the CHOP Multidisciplinary Immune Dysregulation Team for clinicians, researchers and those who care for patients with complex multiorgan immune diseases. 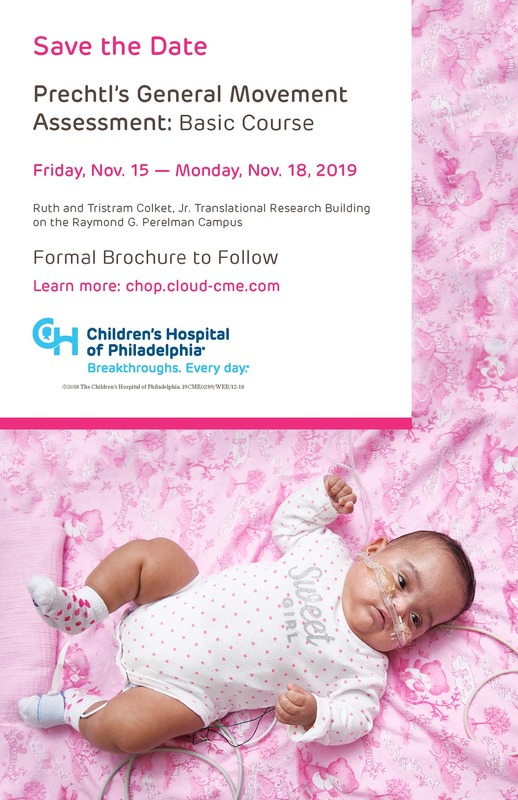 The Division of Human Genetics and the Cancer Predisposition Program at Children’s Hospital of Philadelphia presents a conference on Diagnosis and Management of Beckwith-Wiedemann syndrome (BWS). 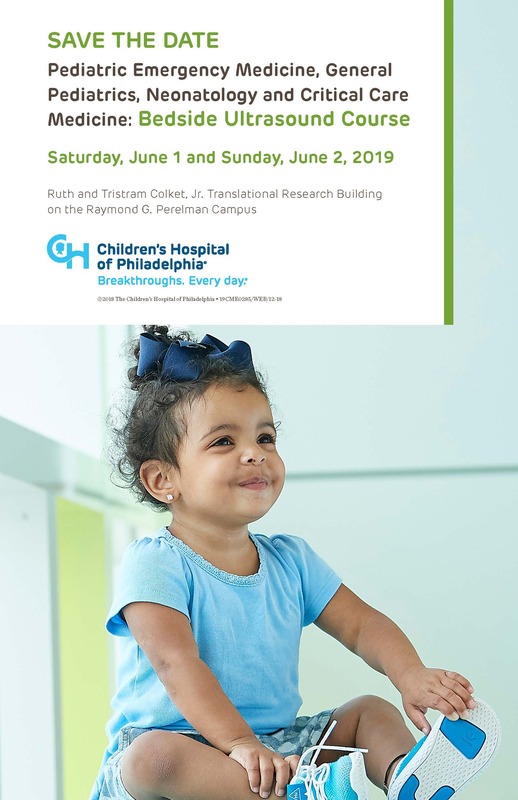 The 2019 course will be held at Children’s Hospital of Philadelphia in the Ruth and Tristram Colket, Jr. Translational Research Building starting the evening of Friday, July 19, 2019, and running through lunch on Sunday, July 21, 2019. 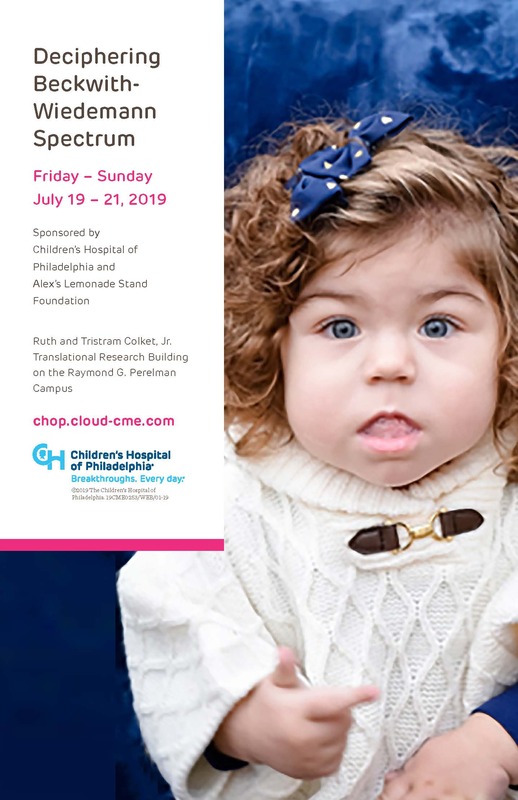 Participants will receive current information on Beckwith-Wiedemann syndrome in neonates, children and adolescents. Parallel sessions are open to families and caregivers of children with BWS and adults with BWS. 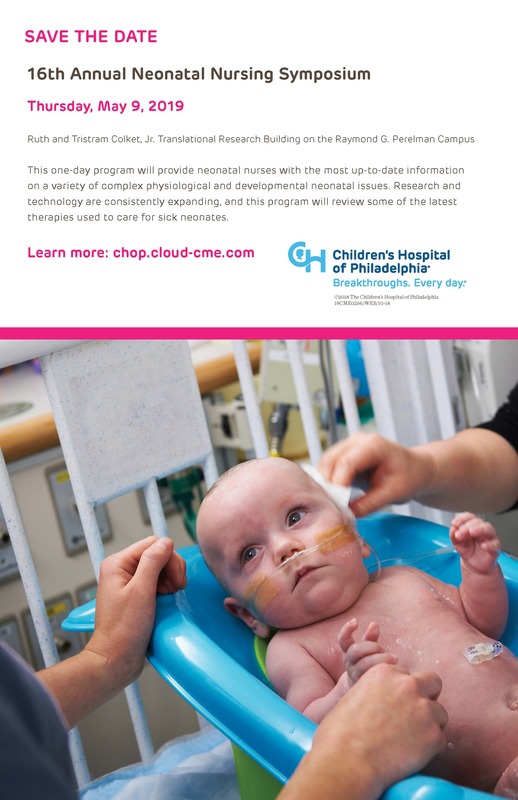 This course is intended for practicing clinicians who care for children, including, but not limited to, pediatricians, family practitioners, general practitioners, genetic counselors, nurse practitioners, nurses, physician assistants, physicians-in-training and other allied healthcare professionals. Other specialists are welcome to attend. 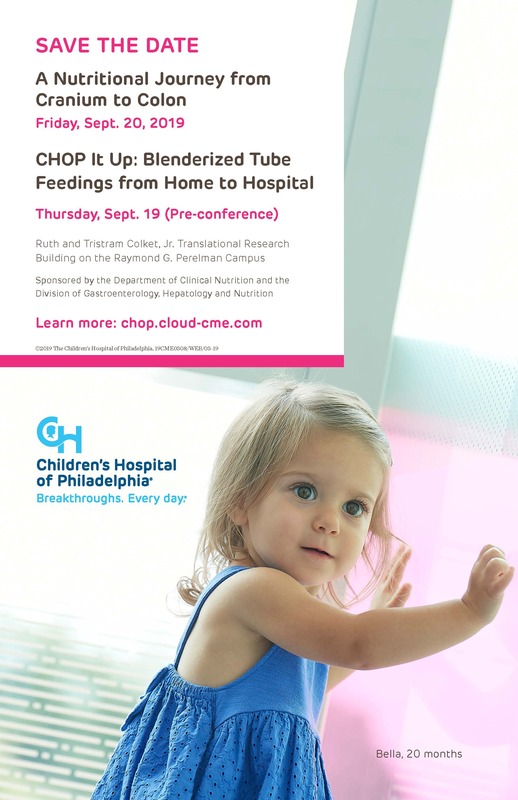 This ½ day pre-conference will focus on practical approaches for clinicians to manage children on blenderized tube feedings addressing the challenges in both the inpatient and outpatient settings through a combination of lectures and hands-on practical sessions. In this one-day symposium, attendees will learn about approaches that support health and well-being, and the relationship between stress, coping and health. Lectures will focus on how to manage provider stress and burnout, and how to support a patient’s well-being. 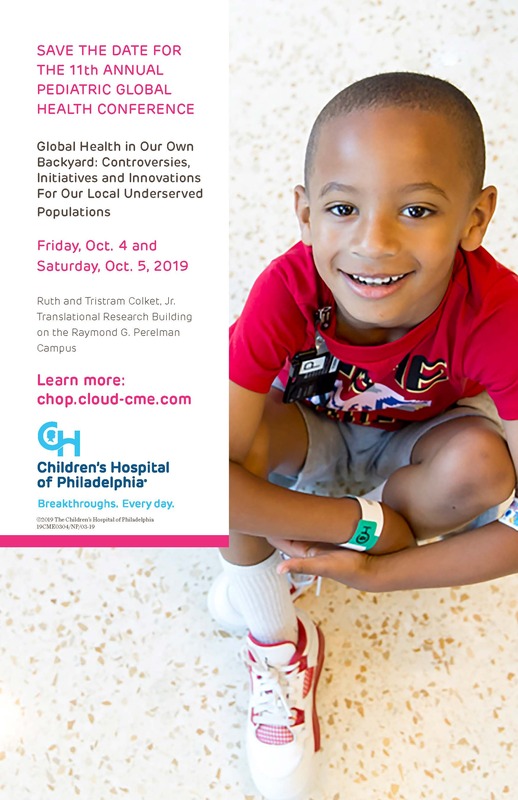 The 11th Annual CHOP Global Health Conference will explore the intersections between domestic local and international global pediatric health to better reach the underserved here at home in the USA. We will take inspiration from innovative programs in the USA and from around the world, and think critically about how to apply both South-North and national lessons to provide better, more equitable care in the United States. Attendees will heighten their awareness of existing disparities and sharpen their skills to both advocate and care for underrepresented patients. Stories of challenges and solutions, keynotes, breakout sessions, discussions, oral poster presentations, and a debate will equip each of us to be more effective providers for all of our patients, especially those who struggle most to access care. The primary care provider for children frequently faces challenges in the diagnosis and management of allergic, immunologic and infectious disorders. This course is intended to provide a practical review and an update of new trends and published guidelines in these areas for pediatricians, family practitioners, nurse practitioners, nurses and other healthcare professionals. This meeting is unique in its focus on the field of hypospadias yet broad inclusion of many topics that will be vital toward advancing our efforts toward improving patient outcomes. We look forward to seeing you in Philadelphia! Simulation education is an innovative training method where physician-anesthesiologists problem-solve issues in a setting that closely replicates actual clinical experience during surgery. This course is designed to recreate realistic and challenging cases, such as insufficient oxygen levels in the blood, difficult airway management, emergency blood pressure issues or cardiac events. 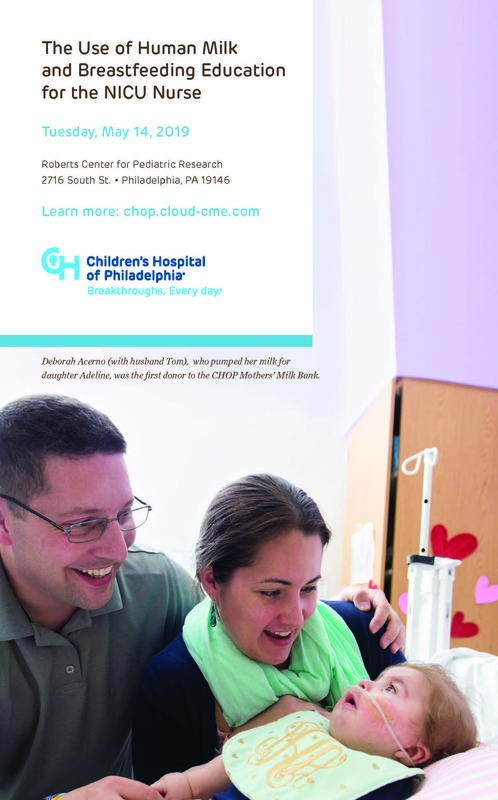 To improve clinical practice and patient outcomes, the Department of Anesthesiology and Critical Care Medicine at Children’s Hospital of Philadelphia follows the guidelines from the American Board of Anesthesiology (ABA) and other related associations on patient safety. 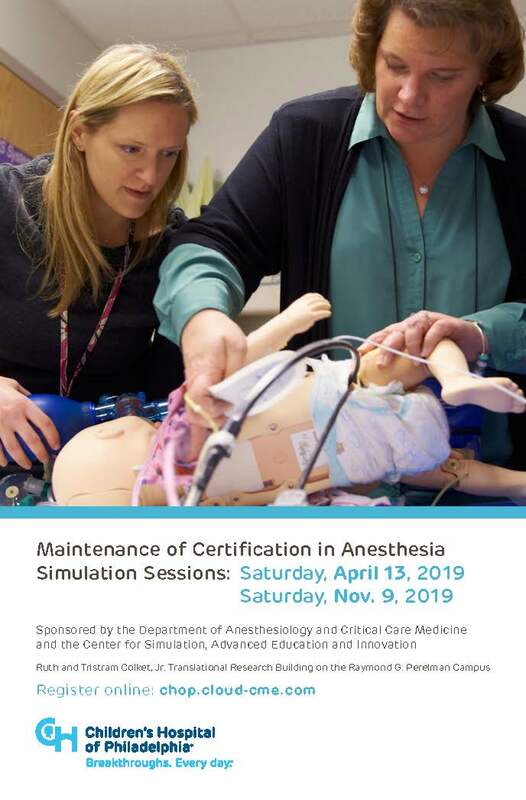 Using these guidelines, physicians are educated through didactic lectures and advanced simulation scenarios to share advances in pediatric anesthesia and critical care medicine practice and address safety issues identified in the department and hospital. This live, instructor-led, advanced simulation course will provide a safe environment to learn about new techniques or drugs and offer participants experience in crisis management, patient safety and professional teamwork that can be difficult to teach in the active operating room arena. 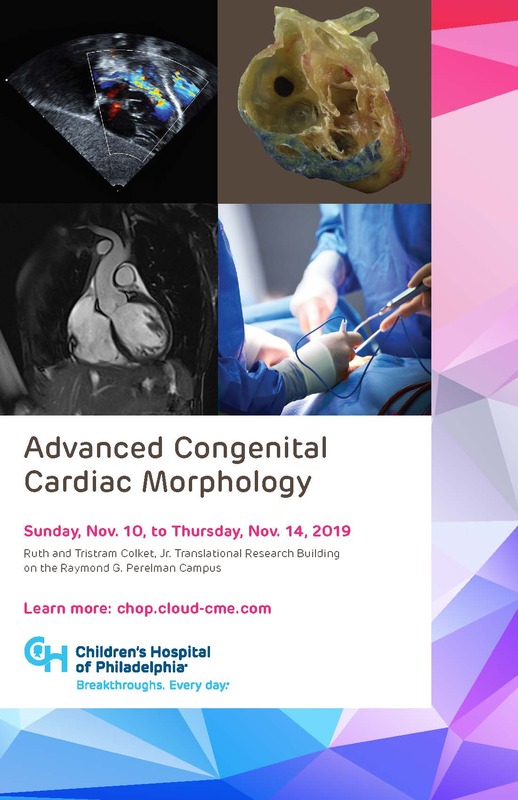 This five-day course is a comprehensive examination of the morphology of congenital heart disease, led by Paul M. Weinberg, MD, FAAP, FACC, renowned cardiac morphologist. This 3.5 day course provides an introduction to Prechtl 's Method of the Qualitative Assessment of General Movements in young infants. Compelling evidence has shown that using this assessment method at a very early age is the best predictor for cerebral palsy. 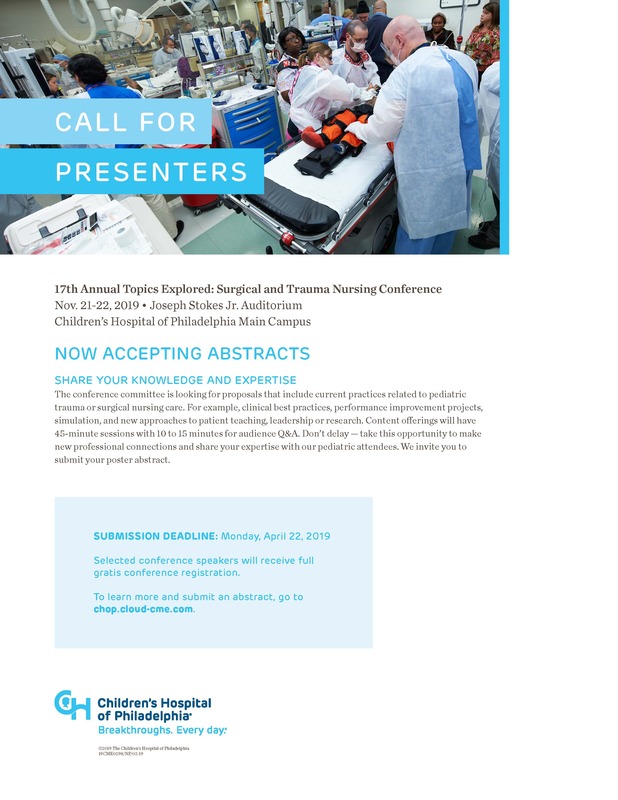 The conference committee is looking for proposals that include current practices related to pediatric trauma or surgical nursing care. For example, clinical best practices, performance improvement projects, simulation, and new approaches to patient teaching, leadership or research. Content offerings will have 45-minute sessions with 10 to 15 minutes for audience Q&A. 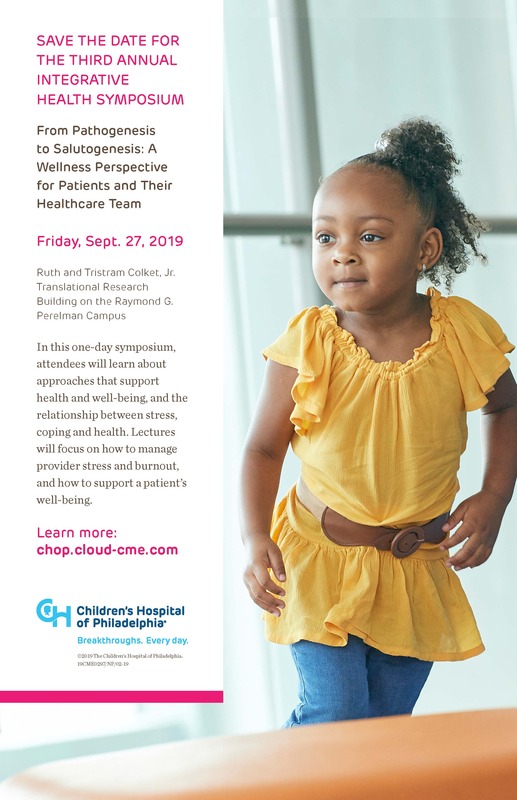 Don’t delay — take this opportunity to make new professional connections and share your expertise with our pediatric attendees. 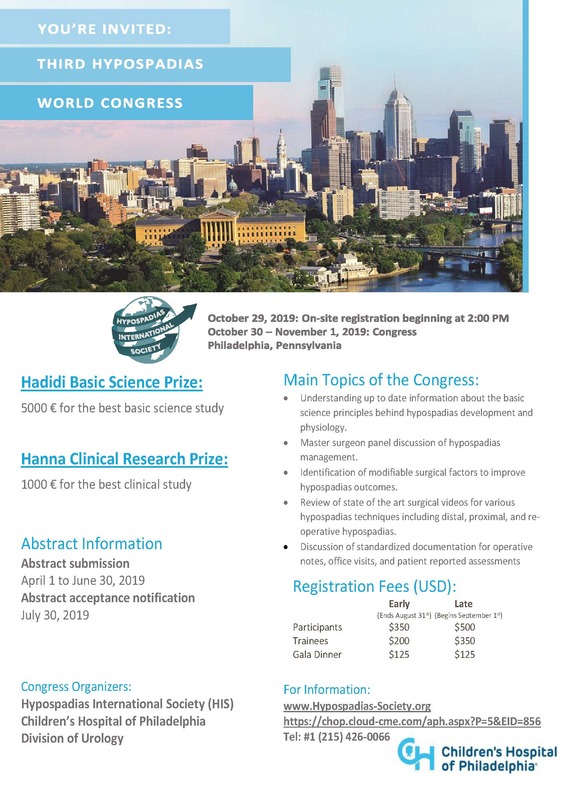 We invite you to submit your poster abstract. Selected conference speakers will receive full gratis conference registration.